As it is the \( \pi \) day of the century I thought I really should write a short blog post about it. Most people know that the first digits of pi are \( \pi = 3.141592653 \), and this year using the american format for representing the date we can get the first 9 decimal places on 3/14/15 at 9:26:53 in the morning. As I will be at #mathsconf2015 then I am going to post this post a bit early, and release it on Thursday, as most schools will celebrate pi day on the Friday before. Since I was at school I have been pretty interested in the computation of pi, I think that this was sparked by my Year 7 maths teacher giving me a book called “The Joy of Pi” by David Blatner when he left the school. In March 2014 David Bailey and Jonathan Borwein (famous amongst pi afficionados) wrote an article for The Mathematical Association of America about Pi Day which is well worth a read and Kate Bush even wrote a song about pi! Admittedly she gets some of the decimal digits that she sings worng…. People have been trying to calculate pi for thousands of years, the babylonians used the approximation \( \pi \approx 3.125 \) and there is evidence from the Rhind Papyrus that the Egyptian scribe Ahmes took \( \pi \) to be the ratio 256/81, or approximately 3.16049 – this is less than 1% off the true value. Pi also seems to come up in the design of the Great Pyramid at Giza; the ratio of the length of one side to the height is approximately \( \pi / 2 \). 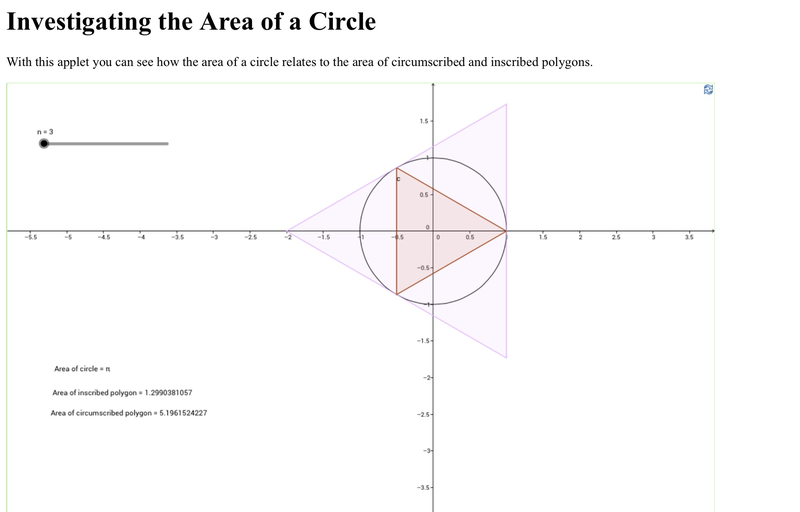 As you can see, working out the area of a 512 sided polygon only results in upper and lower bounds that agree to 3 decimal places. Clearly people needed to find a better method…. Disclaimer: This is a plot generated quickly, I’m aware that it should be a step function style plot!! The (very simple) Matlab code to generate these numbers is here. As you can see, after only 3 iterations we have agreement to 8 decimal places, this very fast convergence (technically it is quadratic) is the reason why the agm algorithm for computing pi is so popular. In 2011 Cleve Moler, the creator of Matlab wrote a great blog post on using Matlab’s variable precision arithmetic to generate digits of pi. In this he presented an implementation of the agm algorithm, which I have modified very slighty and used to compute some digits of \( \pi \) on my laptop. The code is available here and I ran it on a mid 2013 Macbook Air with a 1.3GHz Core i5 processor with 8GB of 1600 MHz DDR3 RAM. 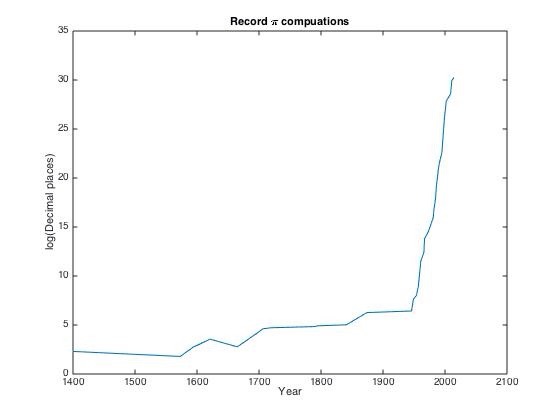 The table below shows the number of iterations and time taken to compute a certain number of decimal digits. As can be seen from the table, the time taken rapidly starts to increase even though the number of iterations is growing fairly slowly. Implementing this in Matlab is obviously not the most efficient way, it would be far better (but harder) to implement it in C++ or Fortran using a robust variable precision arithmetic library. Variable precision arithmetic in itself is costly in terms of memory and computation time. As a non-scientific comparison Moler reported that computing 100000 digits took about 2.5 seconds on his laptop of the time. The original papers of Brent and Salamin are fairly dense reads and include some elliptic integral theory which really isn’t my area. Luckily, a 1984 SIAM Review paper by Borwein and Borwein where they derive a similar iteration based on the arithmetic-geometric mean is much more accessible and is available at this link. The algorithm for computing \( \pi \) is contained in section 5; they also present algorithms for the calculation of other elementary functions. I’m sure I will return to the problem of computing \( \pi \) on this blog in the future. Happy Pi Day!